I'm loving Pixie Pants from Old Navy and am finding them to be super versatile. I can wear them year round, just changing out my shoe and top choice. They have quite a bit of stretch, so I love that they're as comfortable as leggings but have a more polished look. Do you have a trench coat? I have several different colors and they're perfect for layering. You can add a sweater underneath for colder days or a t-shirt for a warmer (rainy) spring day. It's a versatile staple to add to your wardrobe. There are a few cute ones here and here, but keep an eye out for bargains as the spring styles hit the racks, this one came from Sam's Club several years ago! These are the perfect pants to wear with almost any type of shoe. They are right at ankle length (or sometimes a bit shorter if you're taller), so booties work just as well as tall boots. 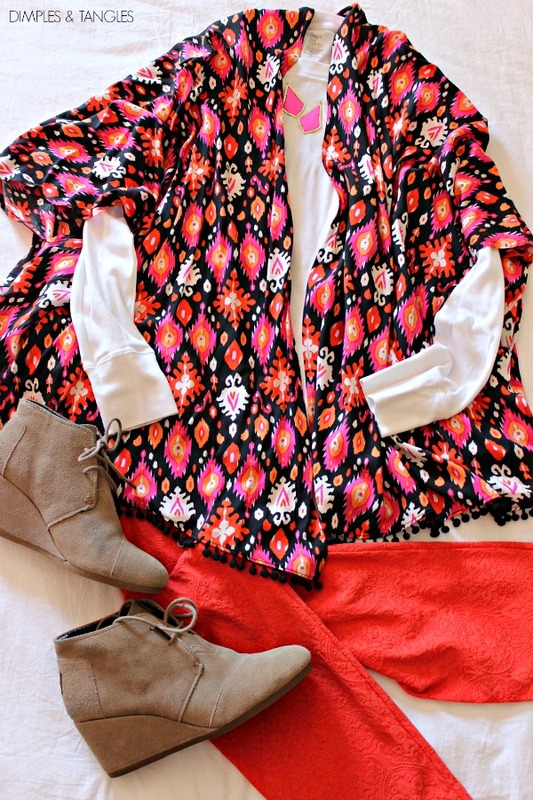 Here I paired them with a long sleeve t-shirt and a colorful kimono for a totally comfortable yet put together look. I wear these through the summer, too, with my leopard sneakers or flip flops. Obviously, with the print of these they were fun to wear at Christmas, too. They're so great with wedges, too. See? They work for any season really, just change the shoes and top! The styles available change often, so although these that I've shown probably aren't current, there is a variety of solids and cute prints available now, many at great deals! One tip for fitting- I go back and forth between 2 sizes of pants depending on brands, but I buy the smaller size in these. They will be very snug when you first put them on, but they stretch out quite a bit within an hour or so of wearing them. There are also long pixies available now if you want a little more length. I'm trying a pair of those next! P.S.- Use code SAVEALOT at Old Navy checkout to save at least 25%! My daughter bought several pairs to wear when she needed a bit more polished look doing some of her therapy sessions. She loves them. And yes, they do stretch after wearing. I may need to pick up some for myself. They look and fit great, regardless of whether you are thin or have a few more curves. I am not sure if I am too old for these or not, haha. 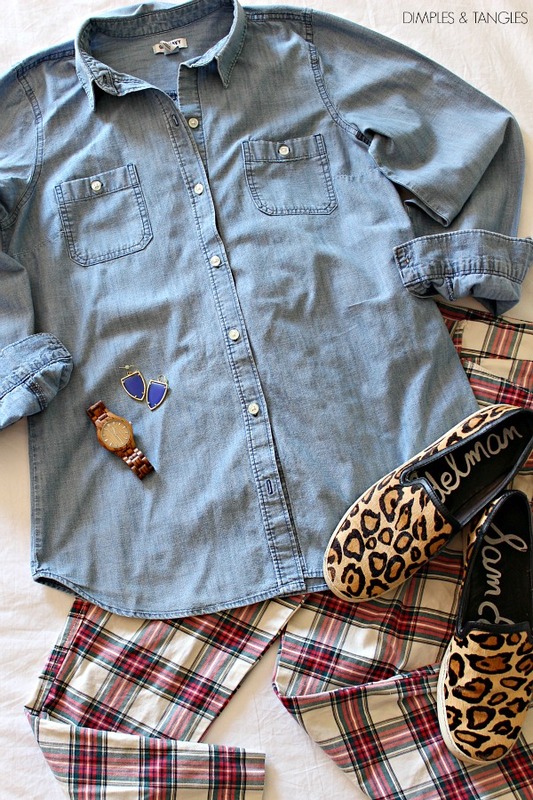 But I just love the combinations you have put together! Your sense of fashion is just like your interior design...chic, colorful, a little playful, and creative! LOVE these, Jennifer! Pinned all four! Super cute outfits Jennifer and I'm so thrilled you are doing these kinds of posts now! 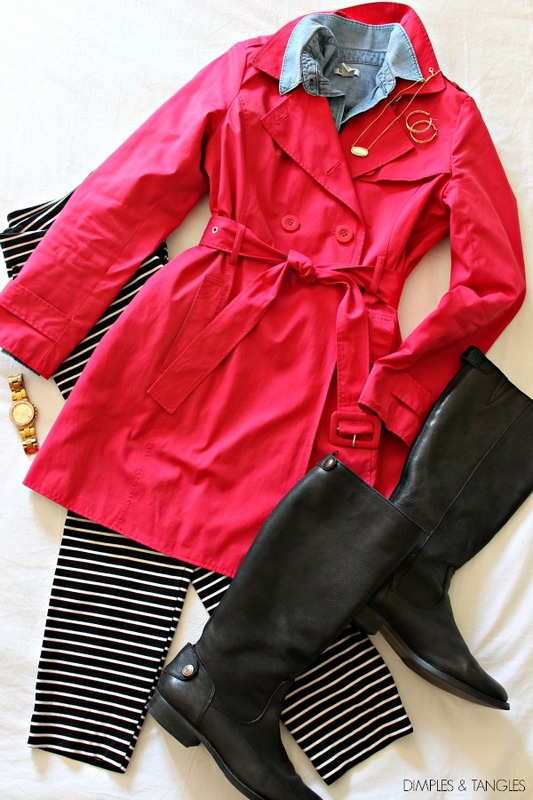 I need that red trench....it's my son's school color and I'm always looking for outwear to wear to games! The pixie pants are really versatile when you consider they can be tucked into boots with a tunic or longer top. You have some fun ones! I have a go to style but have been wondering if I'm a little outdated and am needing a change. Thanks for these trendy, modest options. I LOVE your blog and enjoy these fashion posts. Yes, you do dress super cute and Yes, you have great fashion sense!!! Thank you for sharing and please keep doing it! I have seen several ladies that I follow for fashion inspiration wearing these! They are really cute; I need to check them out! I'm really enjoying your occasional fashion posts. For reference, would you be willing to share your size with us? I love these looks you post, but I have a feeling I can't pull them off with my 5'9" size 14. Either way, keep them coming (with your home blogs, of course!)! I know this is an older post of yours, but I just had to come back here to tell you I finally ordered some Pixie pants and LOVE them!!! In fact, I just did a post about them today (with a link to your original post here, of course) :) Thanks so much for letting us know how great these are!